If I am relocating, can I take the meter to my new location? No you cannot take your meter with you as it remains the property of Ikeja Electric. As a tenant, can I register the meter in my name? No, you cannot, as meters are registered in the name of the landlord. Please let your landlord contact us for more information on how to register your meter. Will I get a meter if I am indebted to Ikeja Electric? Yes you will get a meter, but the debt will be factored into your account. What do I do if I notice a neighbor or an unauthorized person tampering with a meter? 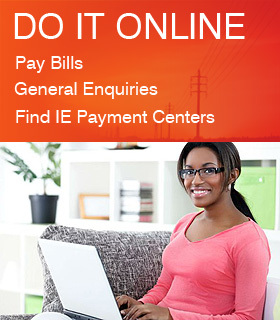 Call Ikeja Electric’s Customer Care Unit to report on 01-4483900, 01-7000250 or 0700-022-5543. If my meter gets burnt, who is responsible? If vandalized, the customer is liable; but if it is caused by a power surge which is traceable to Ikeja Electric, we will replace the meter free of charge. Whose responsibility is it to maintain the meters post-installation? It is the responsibility of Ikeja Electric, at no cost to the customer. However please note that this does not cover cost of willful or malicious damages. We therefore encourage our customers to safeguard their meters. With the new meter, can I build around it or conceal it? No. The meters still need to remain in an easily accessible and visible location to ensure accurate reads by the system. Meters will be periodically checked by Ikeja Electric personnel. “Please contact us so that we complete the installation”. Why? The installation crew was unable to complete the installation and needs to make contact with you. Please call the number indicated on the note (Ikeja Electric’s Customer Care Unit: 01-4483900, 01-7000250 or 0700-022-5543).